Nashville Number charts are basic chord charts (usually written in 4 or 8 bar phrases per line) that use the numbers of the key’s major scale (1,2,3,4,5,6,7) to represent a chord’s root’s name, instead of letters (A,B,C,D, etc.) 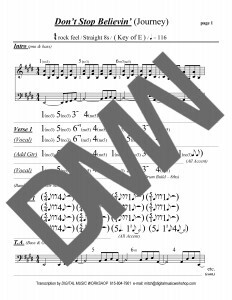 This is a simplified version of basic music theory chord analysis that was first made popular by Nashville studio musicians. 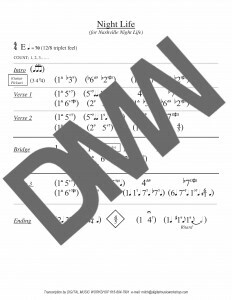 The advantage of reading a chord chart utilizing the number system compared to reading a conventional (letter) chord chart becomes obvious: a number chart can be used in any key without re-writing the chart. For instance, if a singer is struggling to sing a song in a particular key, the musicians simply change the key to suit the singer, without altering the chart. This saves time in the recording studio and in live performances. Nashville Number chart of the Carrie Underwood hit. Same arrangement as the radio single. Transcribed by Mitch Walker. 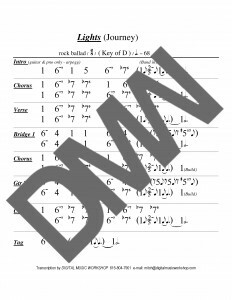 Here’s an example of the Nashville Number system combined with traditional notation to give musicians all the basic information required to play Journey’s hit song. Transcribed by Mitch Walker. Willie Nelson’s classic tune, using the Nashville Number system. Transcribed/arranged by Mitch Walker. Journey’s powerhouse ballad, written as a Nashville Number chart. Transcribed by Mitch Walker. 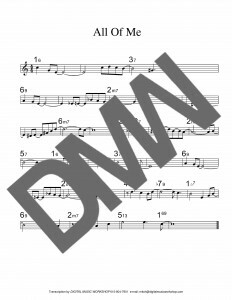 Identical to the All of Me basic chord chart with melody, with Nashville Numbers instead of chord letters. This could be used to learn a song, or for the more advanced player, as a road map for improvisation. Transcribed by Mitch Walker.